Celebrating over 11 years in Bucks County! Updated Wednesday April 17, 2019 by Office. 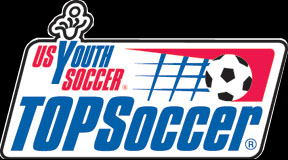 TOPSoccer, or The Outreach Program for Soccer, is a nationally run organization under the U.S. Youth Soccer organization. It helps get soccer programs for children with physical or intellectual disabilities started in communities. This program adapts to the needs of each individual and allows each child to gain experience in a team sport in a non-competitive environment. We are proud of our 1:1 player to buddy and coach! The CBAA TOPSoccer program is offered to children from age 5 years old and up. The program consists of weekly one-hour sessions that provide a fun learning environment in which the players can develop soccer-related skills, learn how to play within a team, and build self-confidence in a positive and nurturing environment. All sessions include fun soccer related activities, shooting skills, and drills as well as soccer matches. CBAA offers two TOPSoccer sessions – Fall and Spring. If you believe your child would have an interest in this program, or if you would like to volunteer to help us with this program, please click HERE to register. The TOPSoccer athlete will develop a sense of belonging to a community and will learn the value of being part of a team. The athlete will experience an increase in self-esteem, fitness and social skills. Success is based upon ability! Volunteer Buddies are essential to make the CBAA TOPSoccer program work. Buddies are responsible for leading players at a time as they participate in the activities set up by the coaches. You should be at least 14 years of age to be a buddy (exceptions are made for buddies who exhibit the necessary maturity). You do not need to have any soccer experience or experience working with special-needs children. CBAA will provide you with training prior to the start of the season. If you are 14 years of of age or older and would like to help our players learn to play and enjoy soccer, please click HERE to register and apply to coach / volunteer.